>More than 50000 globally downloaded APP of Catch Questions’s 14th series! Memory is mainly categorized into two types: Long-term memory and Short-term memory. Generally, people can keep at most 5 to 9 digits of number in their minds and it is very short time for them to be able to remember it if they use Short-term memory. However, the winner of world memory sport such as world memory championships can remember incredible digits of number at once for a long time. Why can they do this hard work? The answer is they efficiently use Long-term memory. One of the famous way to convert Short to Long-term memory is chunking with grouping or using location memory with some story. It is easier to remember number if it is related with some human event. In some trump games, this kind of technique is called “Card Counting”. 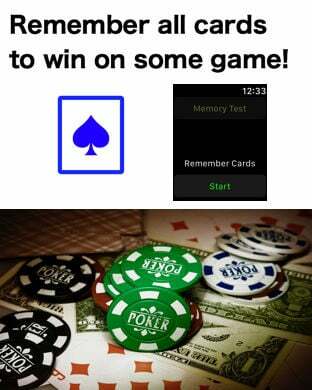 With this, you can increase the winning rate on the game such as Blackjack or Poker. 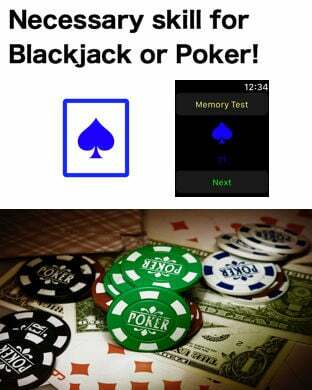 There was a story that the winner of memory sports won too much on Blackjack and he could not play a game in Las Vegas anymore. 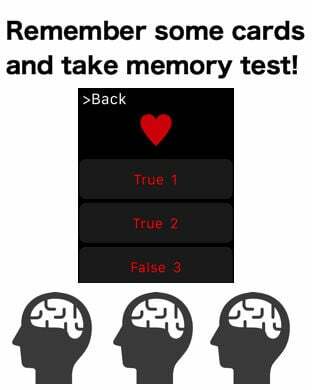 In this app, you can train your long-term memory with some trump cards. It is very useful to achieve the “Card Counting” technique. This app is memory game for Apple Watch so you can play it in your free time only on your wrist. 1. Press START button to start the memory game. 2. 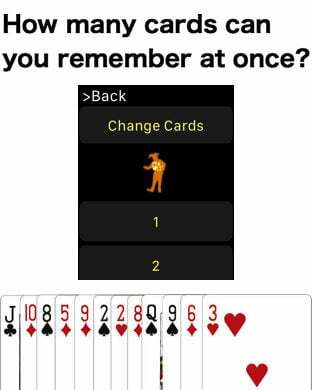 Remember some cards with NEXT button. 3. 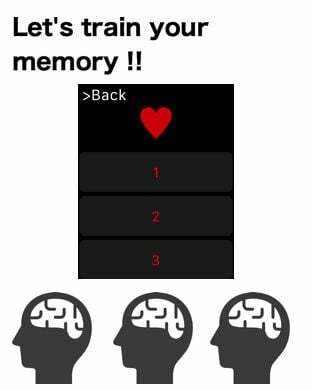 Press MEMORY TEST button to take the test. 4. Press the designated number button to meet the shown cards. 5. CHANGE CARDS button calls the different type of trump. 6. Whether the answer is true or false is shown on the button. 7. You can go back to the front page from >BACK button. 8. With the force touch, you can confirm the all answers. 9. You can also reset the test from the beginning with the force touch.